Hike, bike, walk or run to the grand opening of The BLVD. at Harris Ranch, a new townhome community close to nature. On Saturday, May 7, 2016 from 12-5pm, enjoy custom brewed “The BLVD” beer, music, and catering from food trucks. With inviting outdoor spaces, convenient guest parking and over-sized garages and storage, the BLVD at Harris Ranch offers a fresh approach to townhome living. 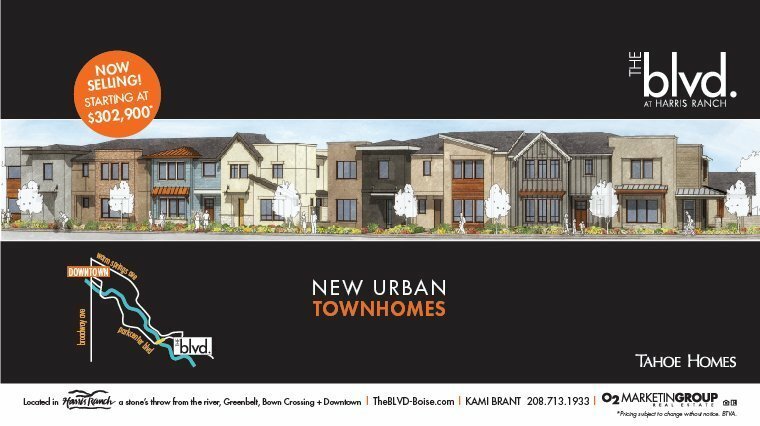 Just outside your door you can enjoy the beauty and amazing outdoor amenities of the Boise River and Greenbelt. Nestled at the base of the foothills, The BLVD. is located in Harris Ranch and is just a stone’s throw from Bown Crossing and a short bike ride to downtown Boise. The BLVD. townhomes by Tahoe Homes all feature 3 bedrooms and 2 1/2 bathrooms; as well as an entertainment bar, mud room and outside living space. The BLVD. was built to appeal to those who’d rather spend their time outside having fun, than doing maintenance on their landscaping. The BLVD. showcases views of the foothills, with attention to details such as high quality designer features, the builder also thought of privacy and included an air space wall between homes, which means no shared common wall. Whichever plan you select, you are sure to find plenty to do in this premier neighborhood in East Boise. Make plans to visit during the grand opening on Saturday, May 7 and celebrate this vibrant new community: The BLVD. Directions: E. Parkcenter Bridge to E. Parkcenter Blvd.